For the first time ever, Jefferson Healthcare has earned the highest available rating from the Centers for Medicare and Medicaid Services based on patient outcomes, joining the top eight percent of hospitals nationwide. Jefferson Healthcare's Chief Quality Officer Brandie Manuel and Chief of Medicine Tracie Harris, MD explained the meaning of the award for the Port Townsend Leader. Business and community leaders from across the North Olympic Peninsula kicked off a fundraising effort supporting Jefferson Healthcare's cardiac rehabilitation program during our fourth annual Well Hearts luncheon. Speakers and special guests at the event included cardiologist Dr. David Tinker, Congressman Derek Kilmer, and others featured in the Peninsula Daily News. Online donations to the campaign are being accepted here. Jefferson Healthcare is deepening its commitment to community health and wellness with a dedicated Wellness Center in the QFC Plaza in Port Townsend. The Wellness Center is dedicated to illness prevention through education, empowerment, and movement. Read more about Wellness Services here, and find class schedule information here. In late 2018, Jefferson Healthcare conducted a complete pricing study to ensure alignment with similarly sized hospitals. Chief Administrative Officer/Chief Financial Officer Hilary Whittington described the process and its results. Wreath artists, local businesses, sponsors, and donors contributed more than $16,500 for the health of our community at the 2018 Festival of Wreaths. Foundation board members Shary Irwin and Marie Dressler described the event here. First Federal Community Foundation has awarded $500,000 in grants to 16 nonprofits serving Jefferson, Clallam, Kitsap, and Whatcom counties, and Jefferson Healthcare Foundation is one of them. Funds support the purchase of a new infant warmer for Jefferson Healthcare's Family Birth Center, the only family birth center in Jefferson County. “When a hip fracture comes in, I come in and take care of that patient until that patient goes home,” says Dr. Paul Naumann, orthopedic surgeon and medical director of Jefferson Healthcare's orthopedic department. “I really keep an eye on the care of that patient.” Dr, Naumann described his team's focus on healing for the Port Townsend Leader. Jefferson Healthcare was recently named a Five-Star award recipient for Hip Fracture Treatment outcomes in a study by Healthgrades, based on performance for this inpatient procedure over the past three years. The 5-star rating means that Jefferson Healthcare is a top performer in adhering to best practice and preventing complications in the treatment hip fractures. The Washington State Hospital Association presented Mike Glenn, CEO of Jefferson Healthcare, with the Joe Hopkins Memorial Award during the association’s 2018 Annual Member Meeting. Additionally, Jefferson Healthcare's population health department was selected for a Community Health Leadership Award. The Joe Hopkins Memorial Award award recognizes "vision and dedication to Washington’s hospitals, with a special focus on rural health care," while the Community Health Leadership Award honors those "health care organizations that are serving their communities’ broader health needs in innovative and lasting ways." For the past 20 years the Puget Sound Business Journal has recognized 40 of Washington’s brightest and most innovative leaders of the business community. This year, Jefferson Healthcare's Hilary Whittington is one of them. Piloted earlier this spring by Dr. David Harris, Dr. Joe Mattern, Dr. Molly Parker, and Sarah Irick, ARNP, the new VegRx program has grown to involve all Jefferson Healthcare providers of annual Well Child check-ups throughout East Jefferson County, Through a monthly credit for vegetables, fruit, and plants at our farmers markets this summer and at The Food Co-op in winter, VegRx helps to supply more fresh food for families in need. Jefferson County Farmers Markets provide full details here. Beginning in 2019, East Jefferson County adults and children insured by Apple Health/Medicaid will have increased access to dental care right here at home. The first of its kind in Washington State, the 6-chair dental rural health clinic will provide cleanings, cavity treatment, and other essential services at the Olympic Medical Office building across from our main hospital in Port Townsend. Jefferson Healthcare's Amy Yaley, Director of Marketing and Communication, described the project for the Peninsula Daily News. Jefferson Healthcare is the only hospital in Washington State to receive the 2018 Patient Safety Excellence Award™ from Healthgrades, the leading online resource for comprehensive information about physicians and hospitals. Recognizing superior performance in the prevention of complications for patients during hospital stays, this distinction places Jefferson Healthcare among the top 10 percent of all short-term acute care hospitals reporting patient safety data. The award will be accepted on May 24 by Chief Patient Care Officer Brandie Manuel and Chief Medical Officer Dr. Joe Mattern, on behalf of all providers and staff who make safety and quality Jefferson Healthcare's highest priority. As registration for Fall 2018 kindergarten begins now, Jefferson Healthcare clinics are providing the vaccinations required to attend public schools in Washington state. The vaccines are free, and insurance, including Apple Health/Medicaid, is accepted for the office visit. Families without insurance and who cannot afford the fee can ask for it to be waived. Additionally, Jefferson County's Public Health Department offers immunization clinics every Tuesday and Thursday afternoon, where no appointment is necessary. For more information, including where to call for an appointment, click here. Port Townsend Paper Company Kraft Christmas Tree Contest to support cancer services at Jefferson Healthcare. Their donation has since been matched 3-to-1 by individual and corporate contributions. 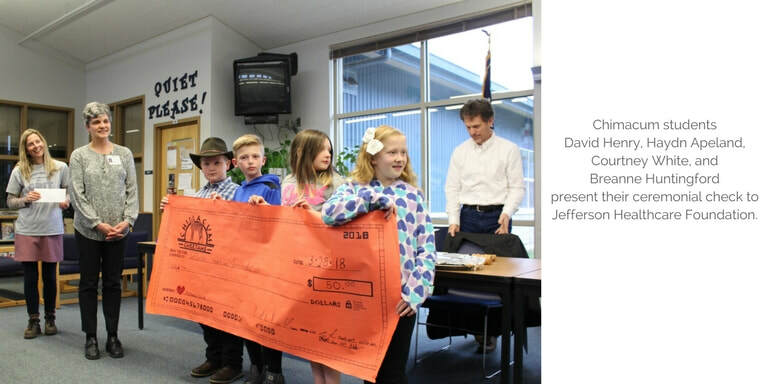 For their kind generosity and thoughtful decision-making process, the students were recognized by the school district's Board of Education at their meeting on March 28, 2018. In the past year, Jefferson Healthcare has created 94 new jobs, worked on access and quality, and expanded specialty services. Learn more in this interview of Chief Executive Officer Mike Glenn by the Port Townsend Leader. The new Express Clinic, open daily from 9 am to 7 pm for non-emergency, same-day treatment of minor illnesses, injuries, infections and allergies, is part of the overall plan for Jefferson Healthcare to meet growing medical demands. Visit the Express Clinic web page for details. Jefferson Healthcare Foundation's 3rd Annual Well Hearts Luncheon continued to celebrate the American Heart Association's National Wear Red Day, to raise awareness and support for ending heart disease and stroke in women. Our Foundation is committed to providing education and awareness about cardiovascular health for our community. Special thanks to our 2018 keynote speaker, Jackie Levin, RN, Holistic Nurse and Coach, as well as featured professionals Karen Forbes, MD, Cardiac and Pulmonary Medical Director, and Ann Hoffman, DO, Women's Clinic Medical Director, for encouraging all our guests to live well from the heart! Sponsors and guests of this annual event help Jefferson Healthcare Foundation provide funding to enhance and expand local cardiac services at Jefferson Healthcare, while enjoying a heart healthy meal prepared by Chef Arran Stark. Read more about our 2018 Well Hearts Luncheon , and please join us next year on February 1, 2019. For the second time in the past five years, Jefferson Healthcare has adjusted its sliding fee scale to be more generous. Chief Administrative Officer/Chief Financial Officer Hilary Whittington described the changes for the Port Townsend Leader.